More than 1,600 years ago, in the year 270 AD, St. Nicholas was born not far from Myra, in what is now modern day Turkey. At that time, Orthodox Christians were persecuted for their faith. Many of them were tortured and executed because of their belief in Jesus Christ. Nicholas was taught by his parents to love the Lord with his whole mind, heart, soul, and with all his strength. When they died he inherited their money. He used this to help the poor, the hungry, and the sick. Whenever he helped anyone he did it secretly, so that only God would know, He did not want praise from people; he wanted his reward to be only in Heaven. After he gave away the money his parents had left him he decided to become a monk. He went to a monastery where he lived and worked and prayed, intending to spend the rest of his life repenting of his sins. But soon it became clear that God wanted him to be a priest, and so he began to study the Law of God. St. Nicholas became the parish priest of a village church after his ordination. He worked very hard, instructing his flock and helping those in need. He also performed all the Divine Services and was a spiritual father to all. It came that the then Archbishop of Myra died. The other bishops, as well as the priests and people of the town, gathered to choose a successor. They couldn’t decide who should be their new archbishop. They kept a vigil and prayed all night long in the cathedral, begging God to guide them. God revealed to one of the bishops that the first priest to enter the church in the morning should be chosen as the new archbishop. At sunrise, a simple priest, Father Nicholas, came quietly into the cathedral to say his morning prayers. In this way the Lord God revealed His choice for archbishop. 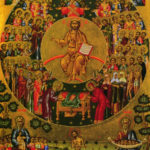 In the year 325 a great Council of the Orthodox Church was held in the city of Nicea. 317 bishops from all over the world came. At this Council part of the Creed we sing in every Divine Liturgy was written down and St. Nicholas had a wonderful opportunity to defend the teachings of the Church against Arius who denied that Jesus Christ was God in the flesh and was leading many people astray by his false teaching. Upon hearing the blasphemies that Arius brazenly uttered against the Son of God, Saint Nicholas struck him on the face. Since the canons of the Church forbid the clergy to strike any man at all, his fellow bishops were in perplexity what disciplinary action was to be taken against this hierarch whom all revered. In the night our Lord Jesus Christ and our Lady Theotokos appeared to certain bishops, informing them that no action was to be taken against him, since he had acted not out of passion, but out of extreme love and piety. St. Nicholas followed the words of our Lord, Lay up treasure for yourself in Heaven, by saying his prayers every day, by fasting, and by performing many good deeds. God was so pleased that He worked many miracles through him. Because he was able to calm storms on the sea he became known as the patron saint of sailors. Because he protected children (he even raised 3 children from the dead! ), he is also a patron of young people. He was able to multiply food, just as our Saviour did with the fish and loaves, and in this way he once kept a whole city from starving. People began to call him a “wonderworker” (a person who works wonders or performs miracles). They were so inspired by his life of service to others that many of them, too, began to lead holy lives, filled with good deeds. After a long life, God called his slave home to heaven on December 6, 343. He was buried in his cathedral, but in the year 1087 the remains of his holy body (relics) were taken to Italy to save them from the Turks who were persecuting Christians and destroying churches and holy objects, and they remain to this day in the city of Bari. The Orthodox Church celebrates this translation of his relics on May 9, St, Nicholas led a life so pleasing to God, that God glorified His saint even after his death, As a sign of God’s grace, a fragrant substance called “myrrh” comes from the relics of St. Nicholas and many sick people anoint themselves with it and receive healing. There is an Orthodox church in Bari whose priest frequently celebrates services before the relics, asking St. Nicholas to pray for us before the throne oI God. People all over the world know and love St. Nicholas. For instance , he is the patron of Russia. Children in America, Germany, Holland, and many other countries know about him. Unfortunately very few know that he was a Bishop of the Orthodox Church. American children don’t know that Santa Claus is St. Nicholas (Santa comes from the Latin for “saint”; Claus is a nickname for “Nicholas”). They know mostly about his gift giving to children; they don’t realize that he was so generous because he loved Christ more than anything else and wanted to serve Him by helping others. Orthodox children are fortunate to know the whole story of St. Nicholas, and not just one small part of it. We should try to tell our non-Orthodox friends and neighbors the truth about “Santa Claus” so that they too, can realize how important and wonderful it is to follow Christ!